Let's start with the obvious (hated) activities: exercise, vacuuming, washing the dishes, cleaning the bathrooms, cooking instead of freezer meals or ordering out. Any of this sounding familiar? I know I'm guilty of loads more, including commenting on others blogs, getting out of the house and socializing. It's not that reading is bad. It's great! It's wonderful! But I notice myself using reading as an excuse, as a way to avoid doing things that require more effort, or that I just don't want to do. (Like exercising.) And even though I'm thrilled to see my Goodreads Challenge more on schedule, this isn't a good thing. At least, not all the time. What's that old phrase? "Everything in moderation." I don't kick myself if I ditch some of the necessities of life for one week in order to catch up on books. But when it spills over into two-three weeks, not only is the house a mess, but I get too wrapped up in my own little world. Which is not good. Seriously, people have gone insane in there. Zumba is awesome; gets out all of my frustrated energy for the end of the day, so I can actually sit back and relax when I get home. I'm continually amazed at the volume of reading you get through along with the kid and cleaning, oh and the husband too. ;) And you still have art! And you seem to be fairly prolific. I have noticed reading especially pushing other hobbies to the side, but I'm trying to squeeze more stuff in. I'm actually around people a lot between work, tutoring and church, but hanging out with friends after a long day often loses out to quiet reading time, and I don't like feeling unproductive at the end of the day either. I feel like I need to accomplish something or check an item off my to-do list. I think the 'Everything in Moderation' is a good truth to follow. Nothing can remain enjoyable in large doses for long periods of time! I've tried..with cake :) But I still use reading as a way to avoid those nagging details of life. What? I need to vacuum again? But I need to finish my chapter!! I have a pretty full plate and sometimes it drives me nuts because I can only manage to read literally 1-3 pages at a time. Even that is interrupted by life. If I do get a reading block it's while I am laying in bed at night counting how many hours and exact minutes I have left to sleep and weighing that against every page! But I hear you, it's hard when you get sucked in. Maybe designate a timer for how long you can read in one sitting, to reset the timer got to get something done off the to-do list? I absolutely put off things due to books :P Sometimes I just get so into reading that I have no problem saying, meh... housework can wait until tomorrow. And then it gets carried over and over haha. 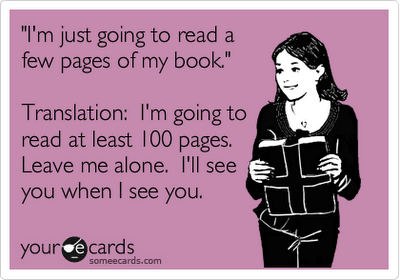 Books are a constant distraction for me... and so is blogging! !